The Italian term ozio has multiple meanings. It is associated with idleness, leisure, sloth, contemplation, inactivity, indolence, inertia, fatigue, either triggered by nature, or by desire or constriction. Historically, ozio is a bipolar concept. This lexeme and its derivatives reflects a long tradition of philosophical, religious and literary engagements, where ozio is used ambivalently, both with commendable and with derogatory connotations. Starting on the 11th of June, a month-long performance series seeks to unravel the bipolarity and ambivalence of the Italian term ozio. 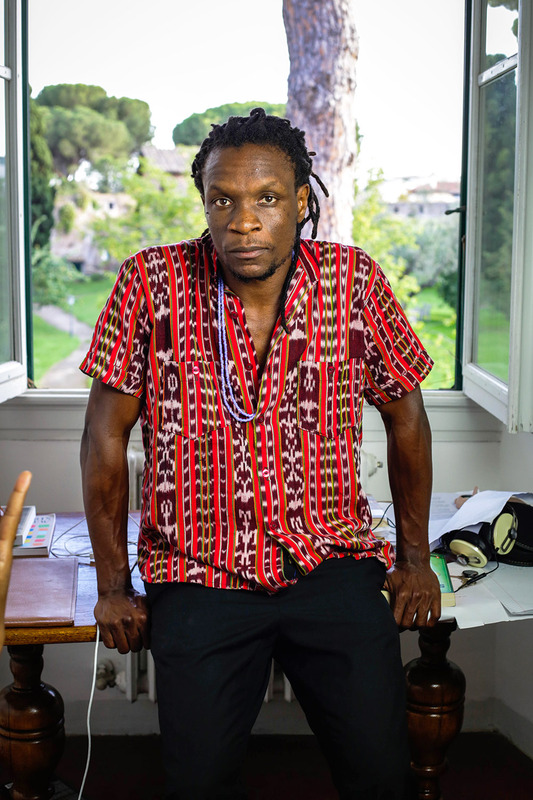 Ishion Hutchinson, a Jamaican-American poet, is one of the artists that will present his reappraisal of Ozio in Palermo, a project curated by Adina Drinceanu, with the participation of Romanian artists Benera e Estefan, and Sicilian artist Concetta Modica. Hutchinson—who is a fellow of the American Academy in Rome for the year 2017-2018—views ozio as a particular island time shaped by sun and earth and slowed down by the vastness of the sea. 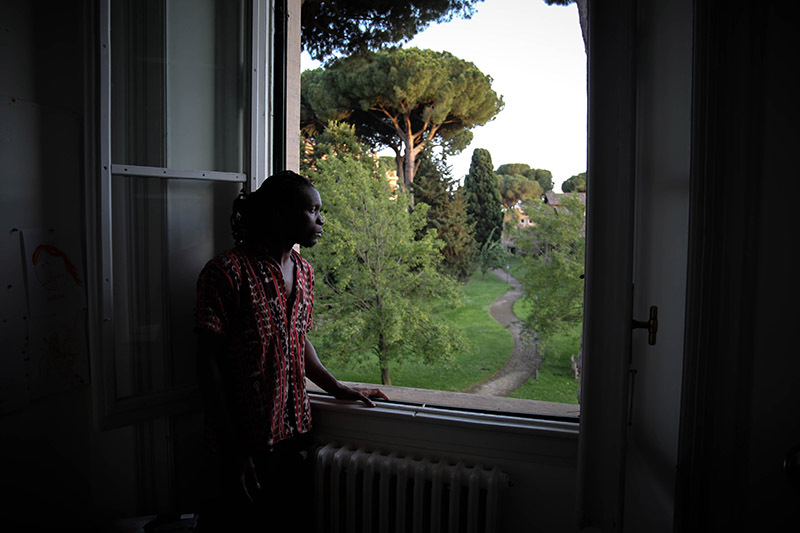 For him, Sicily and Jamaica, despite their different histories, have a kinship, an islandness. 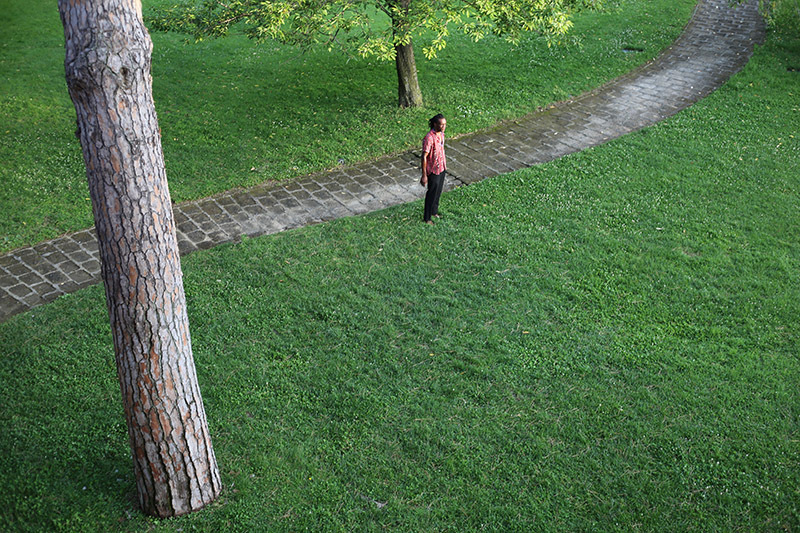 During the Manifesta Biennale Hutchinson will present Abeng, an oeuvre in three acts based on sound. Titled after one of his poems from the Far District collection published in 2010, it refers to the sound made by abeng, a cow horn, blown by Maroons. 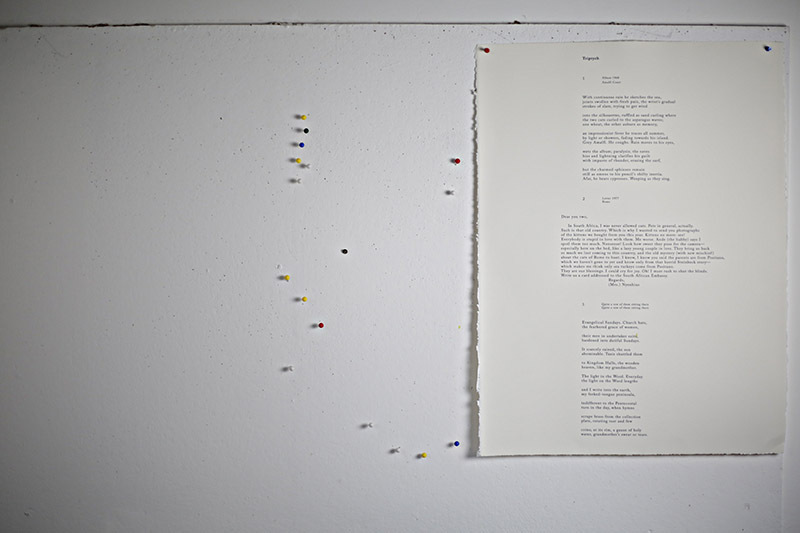 In this work, he interprets ozio as a form of protest against power and the manufactured time of the masters, resonating with writings of Sicilian authors such as Federico de Roberto, Giuseppe Tomasi di Lampedusa, Vitaliano Brancati and Leonardo Sciascia. The first act consists in a soundscape, which goes by the same name, installed in the theatre museum space, while the second is a poetry performance titled Mariner’s Progress. The final act, The Singing-Court of Dread, is a sound and music performance, which seeks to engage directly with the audience and to activate it. 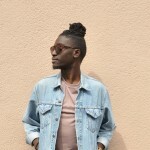 Incorporating elements of New York based artist Sanford Biggers’ multi-disciplinary art practice, which also include antique American patchwork quilts made originally by slaves, “fabric sampled, chopped & screwed & Dubbed for trans dimensional sonic travel”. This last act wants to draw a line between the temporality of ozio, Dub rhythm, making poetry, making signs and theatrical performance. GRIOT called him up in Treasure Beach, Jamaica, while he was preparing for his trip back to Italy. When he picked up, he was on a hammock by the sea. Fittingly, gentle waves punctuated our discussion of words, sounds, poetry, literature and of course, Ozio. GRIOT: In the preview to your performance at Ozio, we are told that Sicily and Jamaica share a kinship, an Islandness. How so? 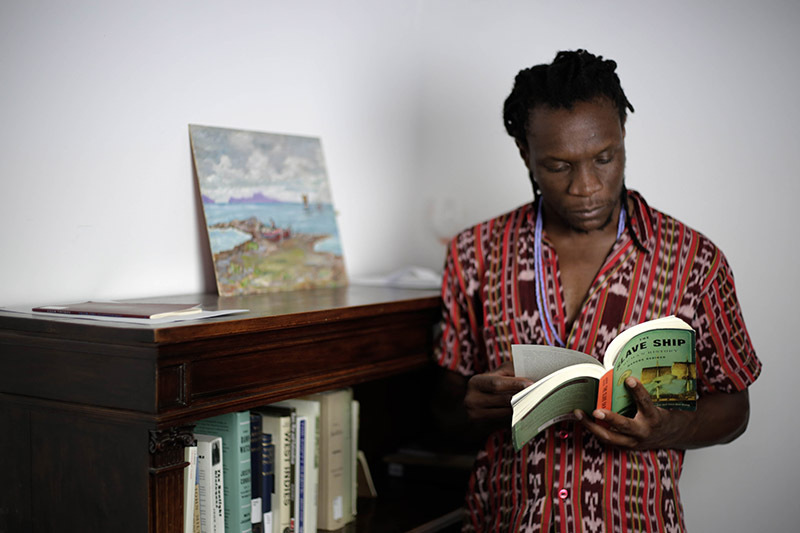 Ishion Hutchinson: Well kinship is probably too strong a word, but both are small places washed by the sea. 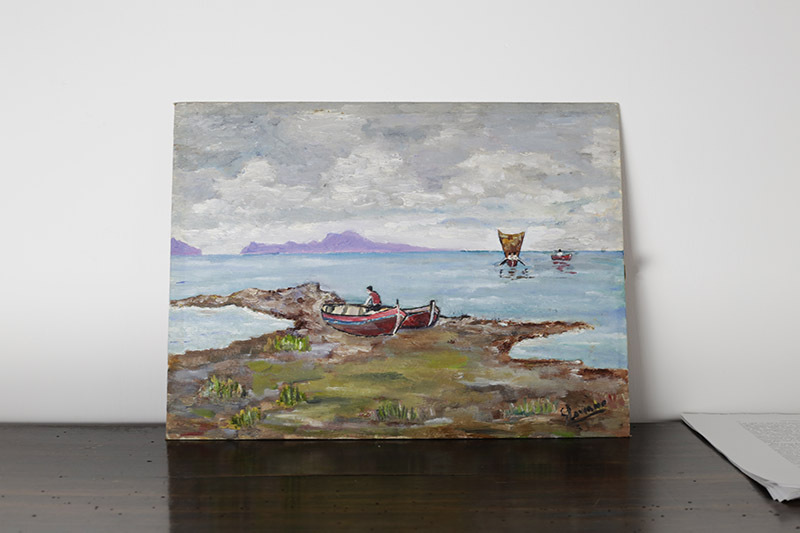 Because of that there’s bound to be a kind of communication or a connection that islands share because they are places afloat in the sea, cut off from the main, having similar backgrounds of a constant venturing out, voyages and so on. They are connected by people visiting, too: a constant stream of foreigners, whether due to invasion or vacation. Of course, there are marked differences in the history of these places. I am interested to find out myself what the similarities are. But ultimately it is within each island’s different dialects or vernacular styles, I always found some kind of reciprocity shared between them, whether or not they are Mediterranean or Caribbean; something sublime unites these island spaces. There’s just that thing about the island, and I am always curious about the ways in which different places enact their Islandness. How did Ozio come about? Adina [Drinceanu] approached me. We met in Rome and she told me about her project and the idea of Ozio which immediately has some sort of Caribbean resonance to me. The word is untranslatable to an extent, but the concept I really get because there’s a way in which island time resembles what she explained Ozio is. I thought of a slowed down temporality where there’s no haste as such, letting things flow at a pace in which one rests and allows for contemplation. If you go around the Caribbean you will see spots or areas where people just find the cool shade. It might seem, on one hand, like idleness, but it is anything but. It is a powerful way of having conversation and sharing without being in a hurry. Everything else is moving at a rapid rate, at a speed that is inhuman. I am also interested in this kind of slowing down, kind of laziness, even, as a form of protest or rebellion against time: most of the peoples of the Caribbean that you see around are descendants of slaves and so in our immediate ancestral past we had that experience constantly shaping our present. One of the ways in which the slaves rebelled against the plantation system was to idle, to cut time, to go at their own pace. That is a powerful way to resist the overwhelming forced reality of slavery by trying to go at their own pace because one is not supposed to have time of their own. 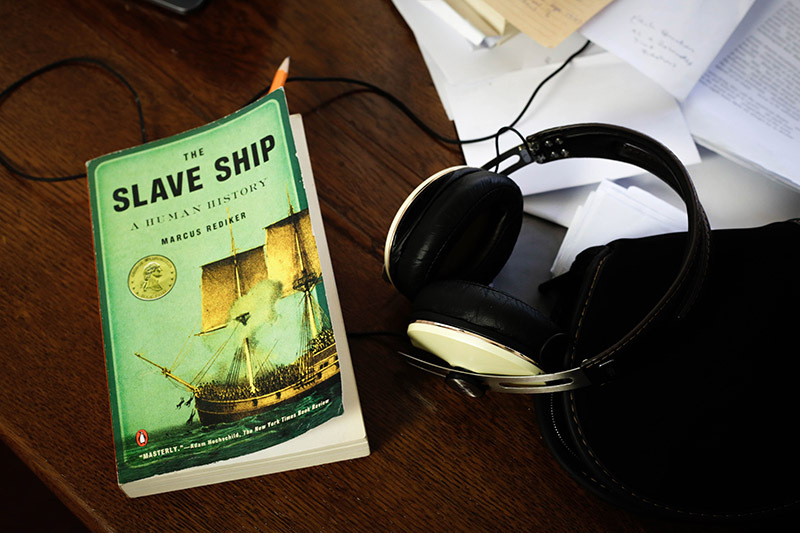 More importantly, particularly later on during slavery, things like the Sunday market emerged, which was a moment where the slaves took that time off the plantation, and dressed in their finest dress and sit around and lounge and perform and so on. So, you have both the sense of time being resisted, and time being used for leisure which people never got a chance to afford. So, whenever that could be attained, it was extremely precious. How does this tie back to the current neoliberal capitalist hamster wheel, in which everybody is always trying to find or make time? Is Ozio also protest against Power in this context? Absolutely. We are in fact, the entire world is enslaved to time and the economy of time. We are always under pressure, we don’t even have to put mortality in the equation anymore because we don’t know when we are going to run out of time as human beings on this planet. The fact that we all have to somehow make ends meet means of course giving up a lot of time: time that could be spent with family, friends and so on, it is an enormous sacrifice. So, in these spaces, I can only speak more directly to my experiences being a Jamaican, people do in fact find time through various means. We move at this tempo that allows us to savour a moment. One of the greatest inventions of Jamaican music is what is called Dub. Dub music is slowed down to the heart rate. It doesn’t go faster than the human heartbeat or pulse. It is overlaid with various instruments and so on, it allows for a person to find space in between the beat to settle into a rhythm, and it insists on contemplation, on having fun but meditating as well and finding this pulse that goes with the body’s natural flow. This music is its linear self, but you have to become the music. It is an incredible and powerful part of the Jamaican space where all over the island there are places that play music at all times, and people gather to become music. They are not gathering just to listen but to in fact become the music that is being played. How do you reconcile the sonic and poetry in your performances, do they come naturally to each other? I grew up with one sort of mantra around me: Word, Sound and Power. That is something that I often heard as a child. It is plain, but it was always a mystery to me as to what exactly it meant. That was my first lesson in poetics really. Words have power, of course. They carry emotional, spiritual powers intrinsically. Which is why we could have these institutions of power making up words which then become law and once you have broken the word, you have broken the law. Thus, poetry realises that and says why not harness the words in order to claim the power. Power in this sense does not ultimately settle for political power, it is expressive power, the ability to speak to a moment and really directly address it. This has been denied to the people of the Caribbean. Our native language was lost in the transatlantic experience, a new language was forced on us. So, these are the ways that we have to reconcile those forced new languages to in fact embrace them. Through the human will to not be a subject, to not be subdued to oppression, there is a process of renewing language. I am speaking in English, but I am speaking as I would want to be heard, that is a terribly difficult process that has to deal with all the trappings, rigour and the necessary but tough task of the legacy: the history of literature itself in England. Hence you cannot shy away from realizing that every word of the English language is coming out of a particular canon. It took long for that word to arrive at this moment. Once I speak that word, I am also engaging that long history, and that history has to also contend with me as a person of this time and moment, who is using the word in order to liberate myself from the word. Sometimes it feels like a paradox, which is where sound comes into play, because everybody has a particular sound. This is the difference between poets really: they may use a similar vocabulary but one thing that they do is to bring a new sound that makes the vocabulary itself new. I’ve been to Kenya, and I have heard the way that people sound when they speak English, and it is not the way a person in London or Kingston would sound necessarily. So, there is a sound that goes simply beyond accent. It is an identity that is rooted in the very soil of a place. Thus, I would describe sound as intrinsic to the poet in a way that is different to the inevitable use of language. In English, we use the words that are there. We are not making up new words but they sound different because I am different, from somewhere else, and the word passes through me in a way that releases this otherness. With sound, the poet has the real arena for creating changes in the pitch of the language, which of course affects our usual sense of time. That is one way I would respond to that. Does the performance aspect particularly highlight on the sonic aspect of poetry? Yes, it does. I wouldn’t consider myself a performer. I read poems, and reading is a kind of performance, whether or not you are performing some kind of spoken word or just reading out loud from the page. With poetry, the voice goes slightly above the pitch we normally use in regular conversation. This is because it shares a relationship with song. Even if a singer sings at her speaking voice, it is always melodically heightened. Reading, what I do, is in that tradition of a performance that heightens the experience a reader may have of just sitting with a book and reading to herself. It is different by reading out loud, there’s something heightened about that. There’s always an element of performance involved even if the performance might not be how we normally think of performance poetry; because, for myself, I wouldn’t see my reading as performance poetry, but i would agree that every reading is a performance. Decolonizing the Mind, the Book by Ngug’i wa Thion’go is experiencing a renaissance in Europe, the long overdue translation into German just came out. How does one consistently reclaim or even occupy language via Poetry/Performance? Funny that you mention Ngugi. Mukoma, his son, is actually my colleague at Cornell [University]. Speaking as a poet who has to come to terms with writing in English and knowing that it can’t be done in a vacuum, we have to accept the fact that there’s a long tradition. We can simply look at an anthology that collects so many different poems from this history of the language itself. But I am also aware that poetry has to be alive, it is a living artform, and I am alive in my contemporary moment and want to speak to that moment as powerfully as possible. I think some of the power comes from looking, not necessarily looking back, but being aware of where the language is coming from. If I write in English, as I am, then I have to confront the English language itself. At this juncture, there have been so many thinkers grappling with and clarifying this issue. I was just the other day rereading Stuart Hall and Erna Brodber, two writers form Jamaica- who were born here- who have taken the history of colonialism and provided us with the vocabulary to address certain things in its complex minefield. We are approaching that, as poets, with a creative spirit, the wish to want to compress and condense not simply advancing this or that kind of politics, but a varied worldview that addresses the position that I am occupying. 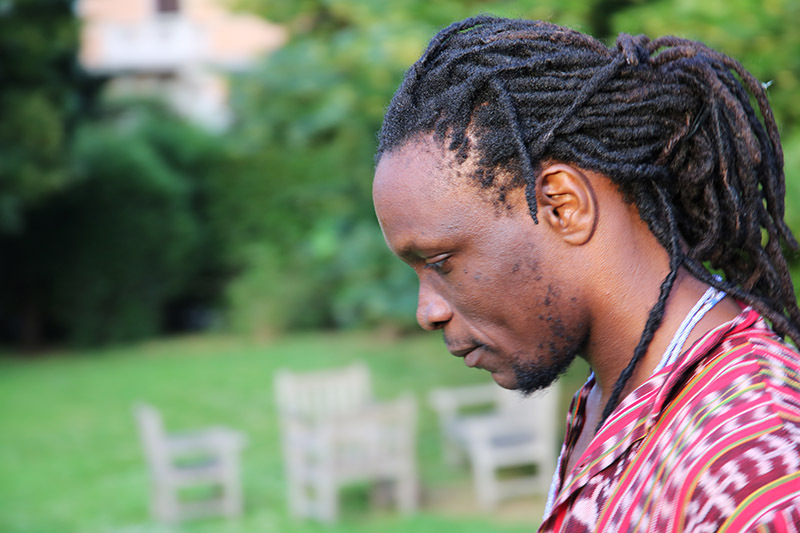 I feel that I do not only have to resort to the tradition of the poetry canon as it exists, but also the ones that are in the process of being made, like the Ngugi’s etc. I think what is very important for any poet, and for any person is to be aware of that dual heritage. I think that’s even reducing it to an extent if we say this is the oppressor’s language, or the oppressor’s books or oppressor’s poetry. Resistance and strong rebellious voices have always been a part of that very canon, and we have to discover them for ourselves. 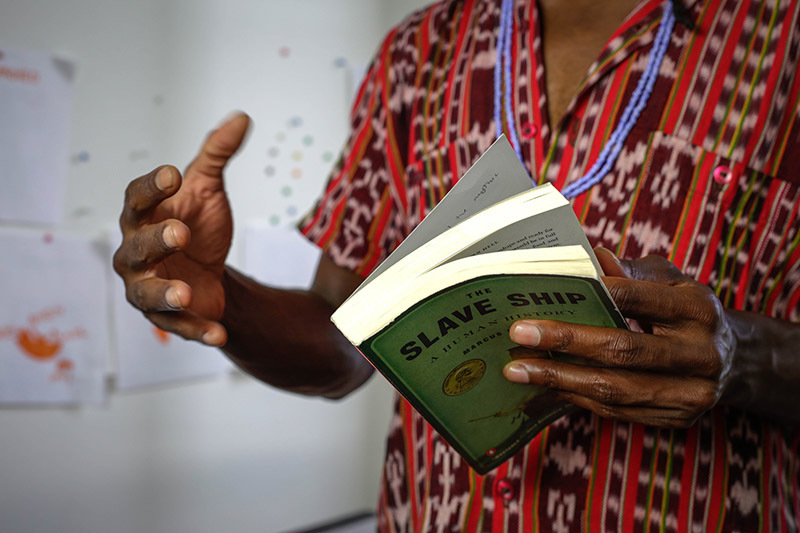 It takes deep reading and research and that can only happen by an autodidactic approach: by being what we have always been actually as peoples of the Caribbean -by breaking the rules of what someone lays down. We go to school; these schools still have that sort of a colonial frame to them. Once you start to read outside of what is given, you encounter so much that lends itself to empowering one’s voice. 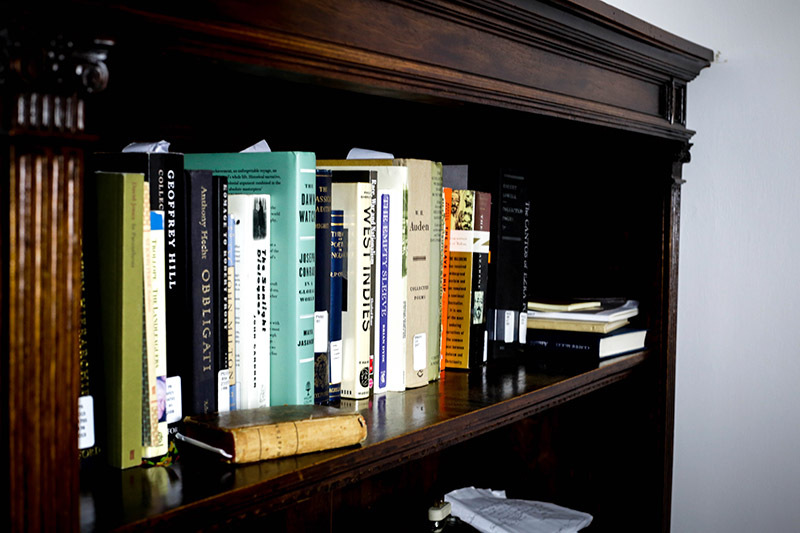 For me the library is a great friend, an ally – and I resort to that a great deal, but you find your people all the time. There is always someone around who can provide guidance. The inner will that keeps you up at night, that makes you think that this is not right, that something needs to happen; that’s a voice that has to be nourished and given all of the tools that one can possibly find. It can only happen by going deeper into the self, but also by searching out ways of finding the expression and the expressive nature that can underscore that will. While sitting in this hammock, I am reading a play by a person named Juliet Giles-Romero. The play is called At the Gates of Gaza, and it is based on West Indians’ soldiers experience of World War One. I have been reading a lot of literature that deals with the West-Indian involvement in World War One, because sadly, the West-Indian participation has never really been honoured, so that is another lost history to be recovered. World War One was such a pivotal time of change for the colonies, particularly when those soldiers returned to Kenya, Jamaica and so on. They were disgruntled and shocked to discover further more how oppressive the ‘motherland’ they volunteered to fight for really was. It was always known that the colonies were not made equal, but to have been to Europe, to experience the war and not receive the respect that they deserved caused them to go back politically energized. So many of our great political movements grew out of those veterans’ passion to want to now force England, France etc for changes. I also just reopened James Baldwin’s Just above my Head, it is one of his late novels and it is fantastic, and many younger poets of recent. There are many poets that I am always reading, whether that’s Geoffrey Hill and so on. I have also been following the African chapbooks series, edited by Kwame Dawes, closely, there’s a very exciting list of poets there. There’s just this wealth of voices around and it’s exciting to see that. 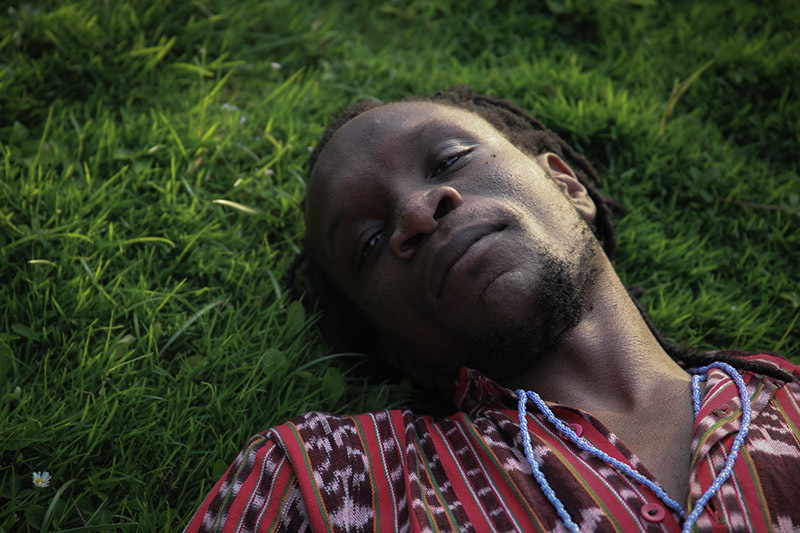 Ishion Hutchinson is presenting The Singing-Court of Dread, Friday, June 15, from 8,30 pm – 11,30 (a performance with Sanford Biggers), and Mariner’s Progress on Sunday, June 17, 8 pm. Teatro Ditirammu – Via Torremuzza 6, Palermo. Find out more here.